Save 10% when you buy a Little Giants washing machine and dryer. Terms and conditions apply. Find out how a Miele on-premise laundry can benefit your hotel or guesthouse. Laundry and dishwashing machines designed to meet the hygiene requirements of aged care facilities. With clean and unclean sides, providing the ideal solution for processing potentially infectious laundry. 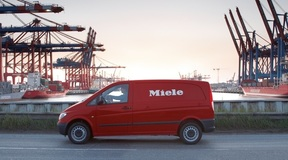 The new commercial office dishwashers from Miele for fast and efficient dishwashing several times a day!